Posted by B. Daniel Blatt at 9:36 pm - November 4, 2012. Just spoke with my brother who tried to get into the Romney rally in West Chester, Ohio. He said he arrived over an hour-and-a-half before it was supposed to start and he couldn’t get it. The line when he gave up was over 1/2 mile long. And the rally was only just starting. Should he win, how could Obama unite what he has divided? Posted by B. Daniel Blatt at 6:54 pm - November 4, 2012. For the most part, Obama hasn’t even tried to campaign on his actual accomplishments, because voters made it clear they didn’t think much of them at the time and haven’t changed their minds. He doesn’t mention the $800 billion of wasted stimulus, barely talks about ObamaCare and omits mention of how he ignored the recommendations of his own blue-ribbon debt-reduction commission. And how, I wonder, will Obama be able to unite a country that he divided in order to stay in office? 30,000 at Romney rally in Pennsylvania? Posted by B. Daniel Blatt at 6:18 pm - November 4, 2012. UPDATE: Jim Hoft says only 28,000 showed up. Still, this crowd in a state no Republican has won since 1988 is considerably larger than the crowds Obama has been drawing. UP-UPDATE: Maybe it was 30,000. Posted by B. Daniel Blatt at 6:14 pm - November 4, 2012. I have to say, I felt like I was in Texas there were so many Republicans in the area. Yard signs were 50/50 but we know RR supporters are afraid to show their support or their cars will get keyed and their signs will be destroyed along with their yard. That is why, in MD, I do not show my support openly unless asked. It was great – there were people flooding the office looking to help where ever they could. Felt like 2004. No wonder people are concerned. In Ohio, cars with Romney bumper stickers have been keyed. Posted by Bruce Carroll at 4:54 pm - November 4, 2012. This is our official GayPatriot Election Night Electoral Map. 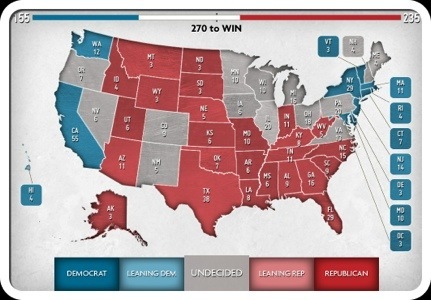 This is not our “prediction” map. This is our Decision Desk map projections based on polls, historical trends and — importantly — actual votes. Late last week, I announced that based on actual early voting stats, I was calling North Carolina for Mitt Romney. Today, we are calling the state of Florida for Mitt Romney based on final early voting in the Sunshine State. All of the other states that have been colored have been projected due to the overwhelming likelihood those states will go traditionally as in the past. The gray states are toss-ups and will most likely remain that way until polls close on Tuesday. Unless I see some important actual early voting stats in a certain state. Finally, yeah I’m going out on a limb with NC & FL. If the actual voting patterns on Tuesday warrant it, we will certainly pull a state back and/or switch our projection altogether. Posted by B. Daniel Blatt at 3:24 pm - November 4, 2012. If Obama wins on Tuesday, he will owe much of his success to his most immediate Democratic predecessor, Bill Clinton. That one-time Arkansan gave the most memorable speech at their party’s convention — and offered the best case for Obama’s reelection despite the sluggish economic recovery. Better to avoid traffic than to hear the presidential candidate you support? SOMEWHAT RELATED: Bill Clinton: Obama’s best frenemy. Posted by B. Daniel Blatt at 2:31 pm - November 4, 2012. One thing which makes me suspicious of polls showing a tight race is the superabundance of reports we read of one-time Obama backers switching to Mitt Romney. We have reported the number of newspapers which had backed Obama in 2008, but have, this time, switched to Romney. Earlier today, John Fund reported that over 30 had switched. And bear in mind that human beings make those endorsements, many of them caught up in the hope-and-change fervor 0f 2008. Bryna Franklin of Jerusalem is a lifelong Democrat and a former chair of Democrats Abroad Israel. She voted for a Republican for president for the first time in her 80 years when she voted this year for Mitt Romney. Mittmentum extends even to New York? Posted by B. Daniel Blatt at 12:21 pm - November 4, 2012. National polls remain tight, but do so polls in states that haven’t gone Republican since George H.W. Bush ran as Reagan’s heir in 1988. This year has brought a complete flip. Romney signs have sprouted like mushrooms, including a big one promising a Romney-Ryan victory celebration on election night. I have also seen two empty chairs, labeled Obama or Nobama. I have spotted only a couple Obama signs. Against this we must weigh Mitt Romney, an imperfect candidate but one who has a special track record too. From his creation of a vast personal fortune to his successful stewardship of the threatened Salt Lake City Olympics to his governing of Massachusetts, Romney’s life is a tale of success after success, many of them achieved in difficult circumstances. Posted by B. Daniel Blatt at 2:42 am - November 4, 2012.
. . . unemployment was 7.8 per cent; today it is 7.9 per cent. Debt is up, food stamps are up, income is stagnant. Bush bailed out Wall Street and so did Obama – even Obama’s much vaunted “rescue” of the auto industrywas actually kick started by Bush. If Bush suffocated civil liberties with the Patriot Act, Obama blew them to Kingdom Come with that awful kill list. In many ways, the policies and performances of Obama and Bush are rather similar. There are some differences. First, Obama accelerated big government trends that he inherited from W – debt as a percentage of GDP is way, way up. Simply put, all that government spending had depleted the Treasury. And Obama never asked the American people to pay for all the “candy” he wants to shower upon them. He filled up our shopping carts with items he, to borrow an expression, just “didn’t pay for.” He only talked about raising taxes on the wealthiest Americans, tax hikes which would barely put a dent in the deficit. He didn’t ask other Americans to pay their fair share for programs designed to benefit them. Posted by B. Daniel Blatt at 1:46 am - November 4, 2012. The latest poll out of the Keystone State shows the race a dead heat, with President Obama and Mitt Romney tied at 47 percent, not a good place for an incumbent to be in a state considered safe for his team as recently as three weeks ago. There’s hope and change for you. With Republican enthusiasm up (likely to be increased by Romney’s visit to the state) and late deciders tending to favor the challenger, it seems very likely that the Keystone Stone could be in the Republican column for the first time in 24 years. Posted by B. Daniel Blatt at 12:46 am - November 4, 2012. 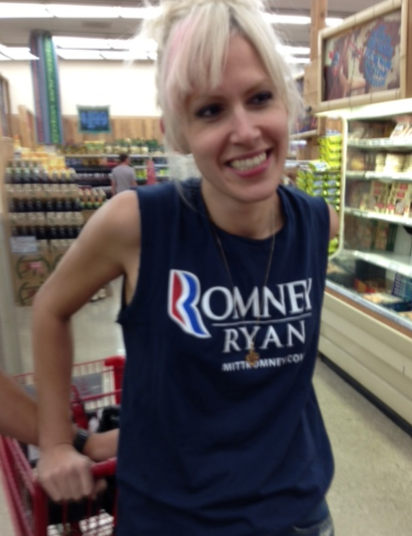 BUILDING ON A READER’S COMMENT: Eric said he’d “LOVE to have heard the comments she got wearing that shirt!” When I saw the T-shirt and introduced myself, she was already engaged in a conversation with a woman in late middle-age delighted to discover someone so open about her support for Mitt Romney. We had a nice chat and even took on a left-of-center patron shocked to see such a T-shirt. . . .